2.Made of high quality 18/0 stainless steel , Large nonslip handle fits any size palm. is a professional manufacturer and exporter of stainless steel products and plastic houseware such as kitchen tools, kitchen cutlery ,kitchen scissors, etc. Our strong product development team, excellent quality control team, together with professional production team make us different from other manufacturers in the industry. Won't break or bend, ideal for home kitchen or professional bakers. 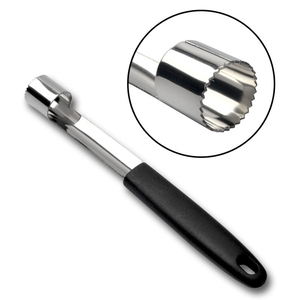 Sharp blade for easy coring - speed up your cooking and baking. 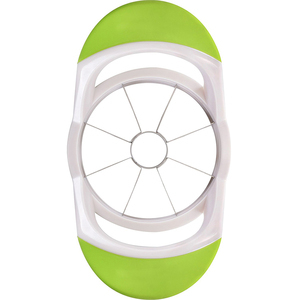 Ergonomic handle to effortlessly twists or push corer through the apple, pear, etc. Item No. Yangjiang Qianpin Hardware Products Co., Ltd. Specifications Apple Slicer & Corer & Cutter 1) Material: PP 2) Packing:Export Packaging 3) Usage: kitchen Company Introduction Lianqi mould and plastic factory specializes in producing recyclable and convenient plastic packing. With rich experience in this industry, our staff will satisfy any of your requirements. Product Details This kind of Apple Slicer & Corer & Cutter is made from environmental plastic, we are the factory, we have very nice price. Item NO. New apple corer has a unique lever that splits the tool in half for easy release of the unwanted core. The shape and contour of the handle provides the strength to effortlessly twist or push the core through the apple. The serrated edge is very sharp and breaks through the skin of the apple easily. Dongguan Li Chang Hardware Co., Ltd.
All you have to do is mount the fruit on the spike holder, turn the handle clockwise, and the blade will peel off the fruit skin cleanly. Rinse the peeling blade under running water, wipe other dirty areas with a sponge, and dry all parts with a towel. Our company currently deals in Kitchen products, Pest repellers , Outdoor sports and electronic products. Majoring in kitchen items with 17 years experience Product information: Item Name: Kitchen gadget stainless steel apple corer 1. Material: Stainless steel 2. CE, LFGB, SGS approval 3. Simple and effective 4. Easy to use and clean 5. Many shapes and many colors 6. Logo & printing: silk print, lithography, laser. 7. Competitive price with high quality 8. Good sale and best service OEM order and custom design are warmly welcome! Product Images: . 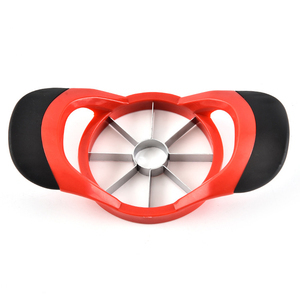 Alibaba.com offers 3,212 apple corer products. About 52% of these are fruit & vegetable tools. A wide variety of apple corer options are available to you, such as fda, ce / eu, and ciq. You can also choose from eco-friendly, stocked. As well as from corers, pineapple slicers, and graters. And whether apple corer is plastic, or metal. There are 3,207 apple corer suppliers, mainly located in Asia. The top supplying countries are China (Mainland), Taiwan, and United States, which supply 99%, 1%, and 1% of apple corer respectively. 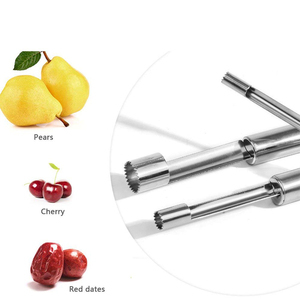 Apple corer products are most popular in North America, Western Europe, and South America. You can ensure product safety by selecting from certified suppliers, including 543 with Other, 266 with ISO9001, and 66 with BSCI certification.